PPAR's: "Peptide Protectors Against Renal Failure?" Peroxisome proliferator-activated receptors (PPARs) are transcription factors that play a critical role in regulating lipid and glucose metabolism, cell growth and cell differentiation. PPAR alpha is expressed in highly metabolically active tissues (alpha = active), including the PT and TALH in the kidney, where fatty acids are a major source of fuel. Activation of PPAR alpha causes genes involved in the control of fatty acid beta-oxidation to be expressed. In mouse models of ischemia-reperfusion and nephrotoxic AKI, reduced PPAR alpha activity leads to reduced expression of fatty acid oxidative enzymes. This causes nephrotoxic long chain fatty acids such as 4-HHE to build up, causing cell toxicity and death. As such, PPAR alpha plays an essential nurturing role to nephrons during AKI. In future, we may give PPAR alpha activators for the prevention of AKI in high risk patients. Indeed, the PPAR-activating fibrates are showing some early promise of fulfilling this role. 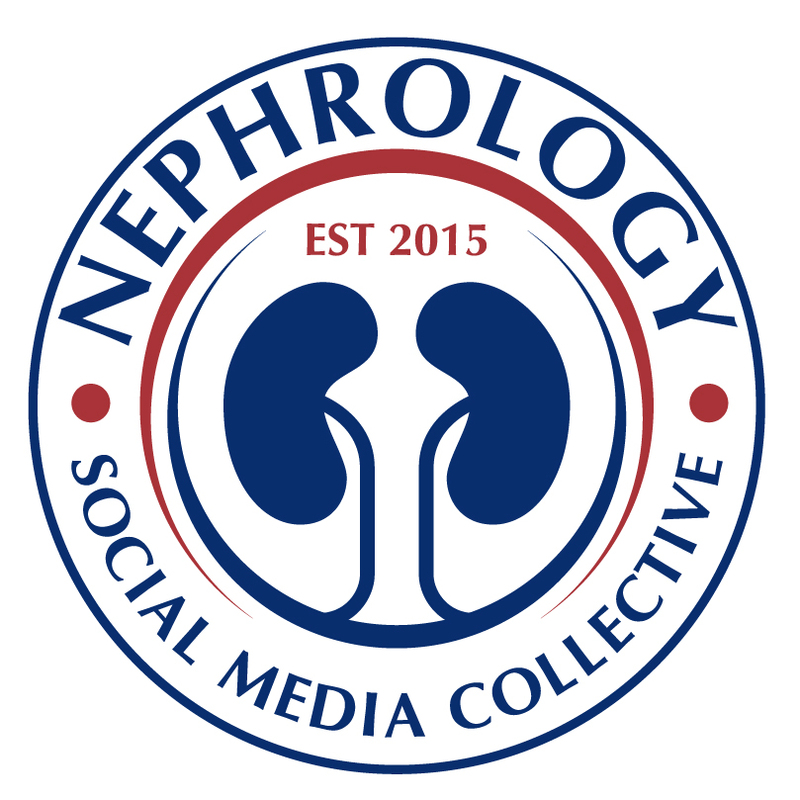 Renal Fellow Network is taking its show on the road...to the ASN meeting in San Diego, CA! 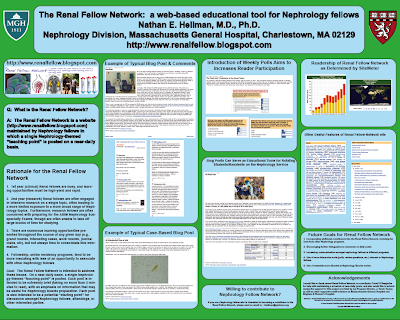 I'm presenting a "Renal Fellow Network" poster at the poster session on Saturday, 10/31 (SA-PO2863) if anybody would like to drop by & chat. Unfortunately, this time slot also coincides with my poster for my research--and therefore I will likely be shuttling back and forth between posters. One thing is for sure: it will definitely be sunnier than the fog & rain in Boston we are currently experiencing! Though this is to some degree controversial, volume expansion with normal saline has been associated with the development of a hyperchloremic, non-anion gap metabolic acidosis. What are the mechanisms associated with saline expansion-induced metabolic acidosis? 1. One of the earliest explanations for this phenomenon was simply that bicarbonate ions are diluted by the isotonic fluid, and acidosis occurs as a result. Thus, this entity is sometimes referred to as "dilutional acidosis." 2. The "Stewart approach" to acid-base metabolism rejected the dilutional explanation above, reasoning that BOTH bicarbonate ions and protons would be diluted by saline infusion equally, and therefore could not be the reason for the development of acidosis. Instead, a concept called "strong ion difference" (SID) is introduced to explain this: in order to maintain electroneutrality in the presence of diluting fluid, water must dissociate, providing excess protons that drive a metabolic acidosis. If I'm not explaining it well, check out this reference for more details. 3. A more recent paper by Doberer et al states that neither of the two mechanisms is true in practice: rather, acidosis develops because there is a dilution of bicarbonate ions (which due to its being in the blood is a "closed system") without there being a dilution of acid in the form of CO2 gas (which due to its ability to be exhaled can be considered an "open system"). Regardless of the explanation, many would argue that the degree of acidosis observed with saline expansion is relatively mild and potentially even clinically insignificant. Get your flu shots, everyone! Renal Fellow Network recently had to take an H1N1-sponsored weekend off, and I strongly suggest getting the vaccine if available to you; this bug is no fun at all. I've written about the ciliary hypothesis of cystic kidney disease before, and it is one of my personal research interests: defects in renal primary cilia are the common pathogenesis of renal cyst formation. Despite large advantages in understanding cystic kidney diseases, however, there remains one really large, looming question: what exactly does the cilia do in normal physiology? Some studies suggest that the cilium is a rigid antennae, functioning to sense urine flow, but it is still not clear how this connects with the pathogenesis of cystic kidney disease. One potential clue to cilia function has come from recent studies which demonstrate that the cilia grows longer in response to kidney injury. Previously, these results have been limited to animal studies; a recent article in JASN by Verghese et al however illustrates that cilia lengthening occurs in human kidneys subjected to ATN! Their study design was fairly clever: they performed cilia staining on serial biopsies of donor kidneys at the time of harvest (prior to any ATN changes having taken place) and then at 6-days post-transplant (after which ATN-like changes were present). 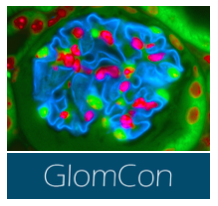 They found a striking doubling in average cilia length following ATN (compare the image on the right to the one on the left; the cilia is the green thread-like structure sticking into the lumen of the tubule). Why is cilia length increasing? Is it simply an abnormal reaction to tubular injury? Or could increasing the length of the cilium somehow be an adaptive response which aids in the recovery of nephron function? The answer is not clear from this study alone, but understanding this phenomenon could turn out to be an important step forward in figuring out the precise role of renal cilia. I've had to revise the renal biopsy complication rates that I'm quoting my patients after reading this review. - AV fistulae occur in as many as 15%, but are usually self-limiting. - Surprisingly, it seems 33% of complications occur >8 hours post procedure. This is jars with my own experience, as I've mainly worked in institutions that practice day-case biopsies without difficulty. There seemed to be general agreement that volume expansion with isotonic saline is definitely effective, and many individuals also selected the isotonic saline + N-acetylcysteine combination. Interestingly, only 23% advocated using a sodium bicarbonate-based regimen (6% iv bicarb alone + 17% iv bicarb + oral NAC) despite its superiority as demonstrated in the oft-cited 2004 JAMA paper in which patients were randomized to receive either an iv bicarbonate or an iv saline regimen, and this recent 2009 AJKD meta-analysis of trials involving sodium bicarbonate for the prevention of contrast nephropathy. However it is essential to point out that this remains a controversial topic, and hopefully further RCTs will clarify the issue. Intracranial pressure increases are buffered by CSF, such that increased ICP leads to increased CSF entry to the spinal cord, increased reabsorption and reduced production. 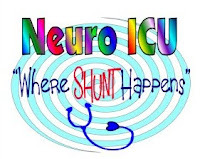 This buffering works best for slowly rising ICP; once this buffering capacity is overcome, the ICP increases steeply, exceeding cerebral perfusion pressure and preventing blood flow. Secondly, even stable outpatients develop subclinical cerebral edema during hemodialysis. This can be enough to precipitate a catastrophe in a patient with raised ICP. Intermittent HD can worsen intracranial hypertension via systemic hypotension (ICP rises when MAP falls), faster removal of urea from plasma than brain and intracellular acidosis (CO2 crosses BBB faster than HCO3). Finally, the integrity of the BBB is a key piece of information for the nephrologist in the NICU. In vasogenic cerebral edema (such as is seen in traumatic brain injury (TBI), acute intracerebral hemorrhage, small vessel vascular disease, hypertensive encephalopathy and infection) the BBB is broken down, and substances commonly used in the dialysis prescription such as mannitol and albumin can cross into the brain and worsen cerebral edema. This may explain the inferior outcomes seen in TBI patients treated with albumin in the SAFE study. Use hypertonic saline instead. The ability to adequately suppress the immune system and prevent allograft rejection has been a true success story over the past several decades. With the advent of drugs such as calcineurin inhibitors, induction agents such as thymoglobulin, azathioprine and later MMF, the vast majority of patients who undergo kidney transplant can count on long-term graft function, especially when compared to the early days of transplant. Despite this success, however, there are many transplant nephrologists who feel that we could do better. One of the great ironies of transplant nephrology, of course, is that the very drugs which have been instrumental in preventing immune-mediated allograft rejection, the calcineurin inhibitors, are themselves nephrotoxic. Ideally, we should be able to develop drugs which are just as successful as immunosuppressants as the CNIs but which lack the nephrotoxic side effects. However, according to this 2008 American Journal of Transplantation editorial by Vincenti et al, a significant barrier towards achieving this goal is created by the current policies of the Food & Drug Administration (FDA), which insists on using outdated regimens for immunosuppression in the control arms of any new transplant RCTs. The authors point out the fact that in 2005, over 70% of current kidney transplant recipients are sent out of the hospital with a combination of tacrolimus and MMF; however, only about 11% of all patients are treated with the "FDA-approved" regimen of cyclosporine and MMF. In order to obtain eventual FDA approval, many current RCTs for new immunosuppressants are therefore tested against the cyclosporine + MMF. Negative consequences of this approach include (a) a reluctance of many transplant centers to subject their patients to the perceived suboptimal control arm of cyclosporine + MMF (rather than tacrolimus + MMF), and (b) a concern that any RCTs are being compared to a suboptimal, seldom-used regimen not comparable to what is currently considered standard-of-care. Finally, another aspect of transplant trials under scrutiny is which clinical end-point to follow. Traditionally end-points such as "# of episodes of acute rejection" have been considered appropriate; there is now a move towards using harder end-points such as long-term graft survival or estimated GFR which are more relevant. As an example of this, recent results from the BENEFIT trial, comparing belatacept versus cyclosporine, show that although belatacept is associated with a higher rate of acute rejection than cyclosporine, it demonstrates improved renal structure and function at one year. Hypouricemia is defined as a serum uric acid level less than 2mg/dL. Although it is generally considered benign, hypouricemia has been associated with several important conditions relevant to nephrologists, including acute kidney injury, uric acid nephrolithiasis, and SIADH as examples. Here's a brief differential diagnosis of hypouricemia, which can be broken down into two main categories: decreased uric acid synthesis, and decreased renal reabsorption of uric acid. 1. allopurinol effect: allopurinol is an inhibitor of xanthine oxidase, the rate-limiting step in the synthesis of uric acid. Thus, allopurinol is a common cause of hypouricemia, though rarely does it cause a complete loss of uric acid synthesis. 2. congenital hypouricemia: individuals with the autosomal recessive disease hereditary xanthinuria have mutations in the gene encoding xanthine oxidase and as a result accumulate the uric acid precursors xanthine, which is fairly insoluble. As a result, individuals with hereditary xanthinuria develop xanthine nephrolithiasis and myopathy due to xanthine deposits in muscle, and typically have a profoundly low serum uric acid level. 3. liver failure: as a majority of xanthine oxidase is synthesized in the liver, individuals with severe cirrhotic liver disease may have a low serum uric acid level. II. Decreased renal uric acid reabsorption. 2. SIADH: a clinical pearl often helpful in the diagnosis of SIADH is that it is very often associated with a very low serum uric acid level, allowing one to distinguish SIADH from other causes of hyponatremia. One possible mechanism for this is that ADH stimulating V1 receptors reduces renal uric acid uptake; this is based on the observation that individuals with SIADH experience a more profound hypouricemia than patients treated with ddAVP (which should selectively stimulate the V2 receptor). 3. Drugs. Some drugs can induce hypouricemia, including probenicid (a direct inhibitor of the organic anion transporter which is responsible for the tubular reabsorption of uric acid) and Bactrim, for instance. 4. Familial Renal Hypouricemia: this is a rare congenital disorder (most common in non-Ashkenazi Jews and Japenese individuals) caused by loss-of-function mtuations in the organic anion exchanger; individuals can exhibit a fractional excretion of uric acid that is greater than 95% due to an inability to reabsorb uric acid. Not surprisingly, these individuals are at high risk for urate nephrolithiasis. File "Gordon Syndrome" under "interesting causes of hyperkalemia and metabolic acidosis you may never see." Also called pseudohypoaldosteronism type II, Gordon Syndrome is relevant less so for the number of patients afflicted but more due to the interesting insights into normal acid-base and electrolyte physiology. Briefly, patients with Gordon Syndrome, a genetically-inherited condition, exhibit salt-sensitive hypertension, hyperkalemia, and a non-anion gap metabolic acidosis in association with a normal GFR. These metabolic derangements tend to be highly responsive to thiazide diuretics, correctly implying the disease is due to a constitutive activation of thiazide-sensitive Na channels in the distal convoluted tubule. In fact, Gordon Syndrome can be thought of as a mirror image of Gitelman's Syndrome, in which there is inactivation of the thiazide-sensitive Na channels causing the exact opposite metabolic abnormalities (hypokalemia and metabolic alkalosis). 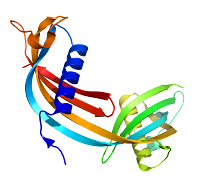 It turns out that Gordon Syndrome is caused by mutations in two different, related genes which encode for a type of kinase: either gain-of-function mutations in WNK1, or loss-of-function mutations in WNK4 ("WNK kinase" stands for "with no lysine kinase"). WNK4 is responsible for tonic inhibition of the thiazide-sensitive Na; its loss-of-function therefore results in unregulated Na reabsorption in the distal tubule. 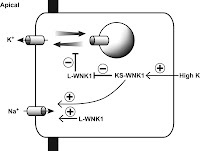 This leads to decreased Na delivery to the collecting duct, resulting in reduced tubular lumen electronegativity, the driving force for aldosterone-mediated potassium and H+ secretion. WNK1 is a negative regulator of WNK4 and this explains why gain-of-function in WNK1 can cause the same phenotype as loss-of-function in WNK4. Part of the clinical phenotype seen in these patients may also have to do with WNK effects on the potassium channel ROMK, illustrating the complex molecular biology of this pathway. 1. Drugs which cause translocation of K from the intracellular to the extracellular fluid: these include succinylcholine, isoflurane, minoxidil, and beta-blockers. 2. Potassium-Sparing Diuretics: drugs such as spironolactone (mineralocorticoid receptor antagonists) and amiloridine/triamterene (blockers of the ENaC) are common causers of hyperkalemia. 3. Inhibitors of renin-angiotensin-aldosterone axis: ACE-inhibitors, angiotensin receptor blockers. 4. Hyperosmolarity: hyperosmolarity induces water efflux out of cells, and by solvent drag increases intravascular potassium concentrations. Drugs such as mannitol can therefore cause translocational hyperkalemia. 5. NSAIDs: NSAIDs can lower renin secretion, which is normally mediated in part by locally-produced prostaglandins. 6. Bactrim: the hyperkalemia induced by Bactrim is via an ENaC inhibitory effect exerted by the trimethoprim moiety. Pentamidine induced hyperkalemia via a similar mechanism. 7. calcineurin inhibitors (e.g., cyclosporine, tacrolimus): it is postulated that these medications inhibit renal tubular responsiveness to aldosterone. 8. heparin & ketoconazole: these drugs may be associated by hyperkalemia by inhibiting aldosterone synthesis. 9. digitalis: digitalis inhibits the Na-K ATPase (which pumps 3 Na out of the cell and 2 K in); as such, it can result in hyperkalemia and a variety of cardiac arrhythmias. Is renal replacement in nursing home residents futile? 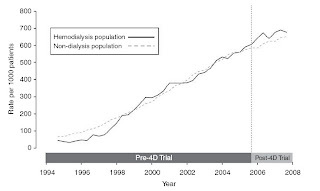 - initiating dialysis was associated with a rapid decline in functional status in this group, such that 1 year later only 1 in 8 patients were maintaining their pre-dialysis level of function. - the mortality rate was extraordinarily high: 50% by 9 months and 75% by one year, which makes me think that dialysis has little if any impact on survival in these patients. 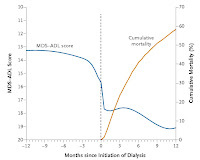 Both of these points are dramatically illustrated in the adjacent graph (dialysis initiation is represented by the dashed line). This serves as a companion piece to Murtaghs classic paper, reviewed by Nate in June. It re-enforces the message that it is level of co-morbidity and functional status- and not age (mean age in this study was only 73! )- that predicts outcome in ESRD and should inform how we counsel such patients in future. An Ever-So Slight Victory for PD? 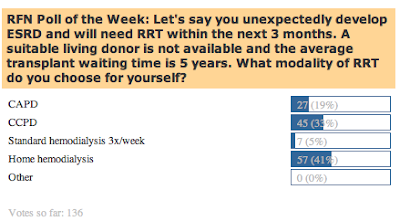 It was a close vote that came down to the wire, but there was an ever-so slight preference for peritoneal dialysis modalities (53% CAPD+CCPD) as compared to hemodialysis modalities (47% standard hemo + home hemo) when RFN readers were posed the question, Which RRT modality would you choose for yourself if you had ESRD? Probably not statistically significant however, so I suppose we should call it a draw between PD and HD for now. Home hemodialysis was vastly preferred over standard hemodialysis, while CCPD had an edge over CAPD. I was pleased to see that there were zero votes for "other" (I had considered including answers such as "Hope for the best," or "Let nature take its course," but decided against it.) Check out the latest Poll of the Week on the right. Serum creatinine > 1.5 mg/dl (133 mmol/l). No improvement of serum creatinine (decrease to a level of 1.5 mg/dl) after at least 2 days with diuretic withdrawal and volume expansion with albumin. The recommended dose of albumin is 1 g/kg of body weight per day up to a maximum of 100 g/day. No current or recent treatment with nephrotoxic drugs. Absence of parenchymal kidney disease as indicated by proteinuria .500 mg/day, microhaematuria (.50 red blood cells per high power field) and/or abnormal renal ultrasonography. Controversially, renal failure during bacterial infection, but in the absence of septic shock, is now considered HRS. This implies treatment of HRS should be started before complete recovery from sepsis. Plasma volume expansion should be performed with albumin rather than the original 1.5L of saline. Minor diagnostic criteria have been removed, most notably the need for a salt-avid urine (low urine sodium). Acute liver injury is not included as a cause. 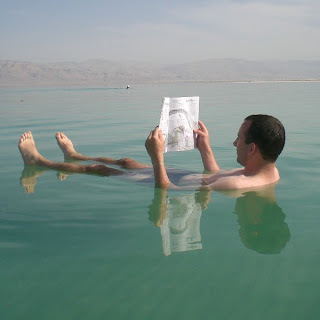 The Dead Sea, located between Israel and Jordan, is considered one the saltiest bodies of water on earth, giving swimmers a peculiar buoyancy when immersed. Interestingly, the electrolyte composition of the Dead Sea is quite different from that of ordinary seawater. The salt composition of most ocean water is 97% sodium chloride, whereas the salt composition of the Dead Sea surface water is only 30.4% sodium chloride with additional contributions from calcium chloride (14.4%), potassium chloride (4.4%), and a shockingly high magnesium chloride (50.8%). This latter point explains why near-drowning victims from the Dead Sea can exhibit profound elevations in the serum calcium and serum magnesium levels, which according to this article by Porath et al can reach levels up to 28.8 and 33 mg/dL, respectively! The authors make the case that early dialysis to rapidly lower serum calcium and magnesium levels is necessary to prevent the major electrophysiologic and hemodynamic consequences of hypercalcemia and hypermagnesemia. Interestingly, in this article and another by Oren et al, the authors point out that the presence of hypercalcemia in these patients is actually protective, in that high calcium levels help protect against the catastrophically high magnesium levels which might otherwise cause respiratory arrest in the setting of hypocalcemia. 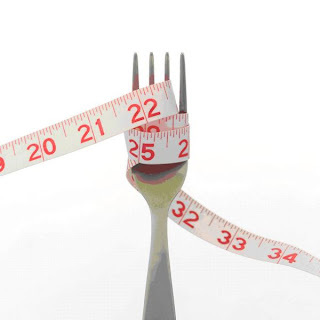 There are some interesting acid-base perturbations that can take place in the setting of eating disorders and/or surreptitious use of substances used to intentionally lose weight. Due to the surreptitious nature of many of these disorders, some lab & physical exam sleuthwork may be necessary to make the diagnosis. Self-induced vomiting is a common feature of the eating disorders anorexia nervosa and bulimia. Because these individuals are losing HCl from stomach secretions, it is not uncommon for them to develop a metabolic alkalosis. Sometimes physical exam clues can be important in making this diagnosis: vomiting induced by sticking a finger in the back of one's throat can result in scarring on the dorsum of the hand, the formation of oral ulcers, dental erosions due to chronic gastric acid exposure, and puffy cheeks as a result of salivary gland hypertrophy. Furthermore the urine chloride is often profoundly depleted; this is classically a "chloride-responsive metabolic alkalosis." Surreptitious diuretic use is also surprisingly common, and metabolic alkalosis is felt to derive from multiple contributing mechanisms: secondary hyperaldosteronism often develops due to volume depletion, renal chloride loss, or a contraction alkalosis; chloride-unresponsiveness may also develop due to a profound K depletion which may result from either chronic thiazide or loop diuretic exposure. Tests which assess the concentration of common diuretics in the urine by chromatography are available and may be necessary to cement the diagnosis. 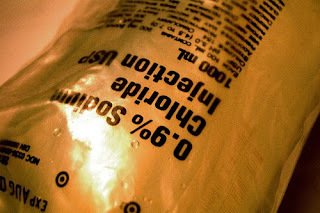 Surreptitious laxative abuse can result in either a non-anion gap metabolic acidosis (similar to patients with chronic diarrhea) OR a hypochloremic metabolic alkalosis which results from hypokalemia, increased renal bicarbonate reabsorption, and volume contraction due to profound loss of sodium and water in the stool. These patients will often present with a fictitious diarrhea, and is found with greatest frequency in females who are related to the health care field. 1. Drink plenty of water (e.g., maintain a urine output of greater than 2-2.5 Liters a day). 2. Eat a diet low in animal fat. 3. Eat a diet low in sodium. 4. For individuals who form calcium oxalate stones (the most common form of nephrolithiasis in the general population), avoid excess oxalate-rich foods, which include spinach, beets, rhubarb, and (unfortunately) chocolate. 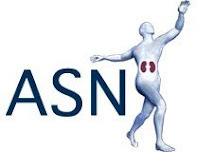 A recent article by Taylor et al in this month's JASN, "DASH-Style Diet Associated with Reduced Risk for Kidney Stones," suggests a similar strategy for kidney stone prevention: using the "DASH" (Dietary Approaches to Stop Hypertension) diet to reduce the risk of nephrolithiasis. 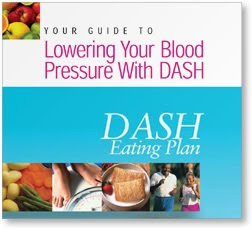 In this study, investigators looked at individuals enrolled in several large cohorts (the Health Professionals Follow-Up Study, the Nurse's Health Study I, and the Nurse's Health Study II) and categorized each individual into separate quartiles according to their "DASH" score--that is, how closely each individual adhered to the DASH diet, which is high in fruits and veggies, moderate in animal fat, and low in animal protein. Interestingly, the greater the adherence to the DASH diet, the less the chance of having kidney stone formation. The beneficial effect of the DASH diet even persisted when controlled for hypertension (which is reduced with the DASH diet and also has been epidemiologically linked to nephrolithiasis). This study provides further proof that some of the dietary interventions are indeed effective at preventing stone formation and furthermore provide a dietary framework with specific recommendations that could be suggested to patients eager to prevent further episodes of nephrolithiasis. Another interesting finding of the study: the highest quartile DASH scorers (which had the lowest risk of kidney stones) also had the highest dietary calcium intake. It's somewhat counterintuitive that calcium-based kidney stones cannot be prevented simply by taking in less calcium, but this and other studies have proven this paradox again and again. The term "T-regs" is shorthand for "regulatory T-cells"--a subpopulation of T-cells which act to suppress immune system activation and promote tolerance towards self-antigens. Although the existence of T-regs was felt to be controversial up until relatively recently, the idea that such a subpopulation exists is now well-accepted, and it turns out that understanding the role of these cells may be invaluable in treating kidney transplant rejection. In the field of immunology, it's all about the markers. Subpopulations of cells are defined based on the presence or absence of specific cell surface markers (such as CD4+ or CD8+ cells). Recent work has attempted to identify the markers which define the regulatory T-cell population: in general, T-regs are CD4+, Foxp3+, CD25+, and CD127-/low. How do we know that T-regs exist? In one early experiment, Sakaguchi et al isolated CD4+ cells from a mouse, subtracted out the CD4+ CD25+ subpopulation, and injected the remaining CD4+ cells into a lymphocyte-deficient mouse, resulting in an autoimmune disease. They found that they could "rescue" the autoimmune phenotype by inclusion of the CD4+CD25+ subpopulation of cells with the rest of the CD4+ population, concluding that this subpopulation is capable of downregulating activated T-cells. From a renal transplant perspective, it turns out that patients with stable allograft function tend to have high circulating levels of regulatory T-cells, whereas recipients with chronic rejection have fewer T-regs. Not surprisingly, this has led to the idea that we may able to better induce graft tolerance by enhancing the number or function of T-regs in a transplant recipient. A recent mini-review in CJASN by De Serres et al describes the effect of the currently used immunosuppresant medications on T-reg function. Very interesting results of the RFN Poll of the Week regarding different opinions regarding managing the potassium bath in a patient with hyperkalemia! Of the options give, there was a near three-way split between the first three answers (giving a 1K bath, giving a 2K bath, or a giving a 1K bath and then changing to a 2K bath after one hour). In my opinion, this speaks to the overall lack of data describing what one should do in managing hyperkalemia during dialysis! I would also imagine that an individual's choice would be highly influenced as to where they trained or what the practice patterns are at their individual hospitals. Personally, I was taught the "rule of 7's"--the patient's serum K plus their dialysate bath K should equal approximately 7. 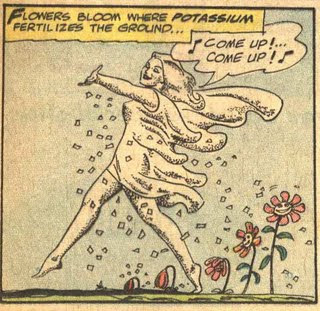 Unfortunately this tends to break down at higher potassium levels. Check out the latest Thursday Poll of the Week question on the right! 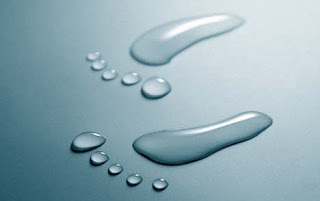 The easy way to calculate total body water is simply to multiply 0.6 times your weight in kilograms, since roughly 2/3 of your body weight is water. There are fancier (and more accurate) equation-based calculations used to determine total body water as well. These include the Watson formula, the Hume formula, and the Mellits-Cheek formula (specifically designed for use in children). A handy link to a calculator using these formulas can be found here. How were these formulas arrived at? For the calculation of the Watson formula, for instance, dilutional methods using deuterated water (a.k.a. "heavy water") were carried out in order to obtain a "gold standard" of total body water for a large population of normal individuals; statistics were then applied to generate an equation which accurately predicts TBW based on variables such as weight, height, age, and gender. To carry out such a study, a known dose of heavy water (D2O) is ingested by healthy volunteers and allowed to equilibrate with total body water. Then, a mass spectrometry instrument is used to measure the deuterium:hydrogen ratio in exhaled body water vapor; the total body water can then be calculated by determining the increase in breath deuterium content in relation to the volume of heavy water taken in. An alternative technique to determining TBW is using bioelectrical impedence analysis. Personalized Medicine for Kidney Disease? Interesting review in this month's CJASN: "Can we personalize treatment for kidney diseases?" by Rovin et al. The term "personalized medicine" has been defined by the U.S. Congress as, "the application of genomic and molecular data to better target the delivery of health care, facilitate the discovery and clinical testing of new products, and help determine a person's predisposition to a particular disease or condition." Although the idea is old, in practice the field is still in its infancy. While there has been an enormous progress in terms of identifying clinically relevant polymorphisms in genes for common disorders, this has yet to translate into practical guidelines useful in the treatment of real-life patients. The article by Rovin et. al. gives a few examples of how personalized medicine might be used in the future. For instance, they describe the presence of a relatively common (up to 11% in white populations) polymorphism in the gene encoding for cytochrome P450 system, required for metabolism of cyclophosphamide into its active form. It is possible that individuals with glomerulonephritis containing this polymorphism could be undertreated when given a standard dose, and perhaps in the future genotyping might allow for more appropriate titration of drug levels. There are already companies touting the benefits of personalized medicine--for example, the company "23 and Me" offers for a mere $399 the opportunity to have your own DNA analyzed for 117 different traits and diseases, essentially genotyping for a library of several published SNPs which have already been associated with these conditions. Is this useful? Probably not currently--it would be hard to justify using this information on a patient bringing you the results--but there are many who believe that in the future this will be standard practice. The winners of the 2009 Nobel Prize in Medicine were revealed today, shared by three Americans: Carol Greider, Elisabeth Blackburn, and Jack Szostak, the latter of whom works at my home institution of Massachusetts General Hospital. The award was given for their work on telomeres, the regions of repetitive DNA which form protective "caps" on the ends of chromosomal DNA, necessary for preventing the degradation of DNA ends. 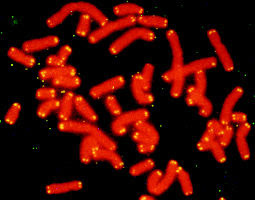 The study of telomeres has implications not only for basic molecular biology, but also for cancer biology: many tumor lines express an enzyme called telomerase, which catalyzes the addition of telomeres onto DNA ends by virtue of a reverse transcriptase-based mechanism, allowing cancer cells to sustain their high rate of cell division. For instance, in a 1999 KI study by Dahse et al, increased telomerase activity was detected in 55 out of 60 different primary renal cell carcinoma lines. Is cystatin C the next creatinine? As we all know, there are significant limitations to the use of creatinine as an estimate of GFR. Creatinine is freely filtered at the glomerulus, but in addition is also secreted to some degree, meaning that creatinine clearance can overestimate GFR. Furthermore, since creatinine is produced by muscle, individuals with high muscle mass may have a calculated GFR which is low despite actually preserved renal function. Another failing of creatinine-based GFR calculations is highlighted by the ability of creatinine to predict all-cause mortality: although high creatinines are associated with a higher risk of mortality, individuals with extremely low creatinines, perhaps reflective of a poor nutritional status or low muscle mass--also show poor mortality outcomes. In a recent article in JASN by Astor et al, the investigators provide evidence that cystatin C does a better job of predicting mortality than creatinine. Cystatin C is a cysteine protease inhibitor which is freely filtered at the glomerulus, but not secreted like creatinine is. Furthermore, cystatin C production is independent of muscle mass, making it less susceptible to the limitations of creatinine. One of the main strengths of the study is the it uses data from NHANES, which is generated from a large and ethnically diverse U.S. population with a long follow-up time; it also contains a large number of individuals with only mildly reduced GFRs in the CKD3 range. The apparent superiority of cystatin C to predict mortality and provide more accurate assessments of GFR compared to creatinine suggest it could eventually play a major role in routine lab assessment in many of our patients. It can often be difficult to stop something once it's been started; take statins for example. It seems that despite consistent evidence from two large, randomized controlled trails demonstrating the lack efficacy of statins for preventing cardiovascular mortality in dialysis patients, there has been little impact on the prescribing habits of nephrologists. This study shows that in the 2 years following the negative 4D result, the rate of statin prescription in diabetic hemodialysis patients actually increased by 10%. There are probably several reasons for this practice, such as scepticism about the result in ESRD patients given the proven efficacy of statins in other groups, or a reluctance to engage in therapeutic nihilism. Personally, I worry about precipitating a cardiovascular event by stopping these drugs; the 4D and Aurora trials do not address the issue of discontinuation. With such a high rate of cardiovascular events in this population, aren't you just asking for trouble by drawing a line through the Lipitor on the medsheet? It's a thorny question, and one we may put to poll on this blog next week. The readers of the Renal Fellow Network have spoken, and the answer is clear: the most blood pressure elevating activity is catheter-related! 29% of fellows selected the first answer (the MICU nurse paging you to inform that your IJ catheter is malfunctioning), with the second answer (your program director asking you to pick up the slack by double-covering services) coming in a close second at 25%. Thanks for voting and be sure and make your voice heard in our latest Poll of the Week on the right.